This little saying gets thrown around a lot here at the greenhouse. It’s a quick and easy way to remember not to plant things too deeply, which is a common mistake that many new gardeners make. Unless you’re a veteran gardener who knows your plants and which are the exceptions, following this rule will help more of your plants survive than not. Many people just don’t think about it. They plant their flower beds and vegetable gardens, and if something gets planted a little too deep, they don’t even notice. So why is it important not to plant things too deeply? Because it will make it harder for your plants to grow and could even cause their stems to rot off. 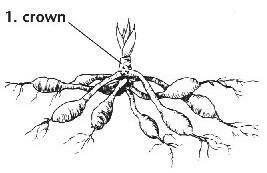 The crown of the plant is where the stem meets the soil and turns into the root system. Ideally, the crown should be level with the soil, and most plants don’t like to be planted any deeper than the crown with many doing just as well when planted a little higher. As mentioned before, there are a few exceptions to this rule. Tomatoes, for instance, should be planted with the crown of the plant several inches deep. The reason for this is that all of the stem that’s underground will send out new roots that will help strengthen the plant and allow it to gather more nutrients. Some sedums will do the same and can be planted deeper than the crown. Even the plants that can be planted deeper will do just fine when planted with the crown at soil level as well. One plant to be especially careful with is the tuberous begonias as they are susceptible to rotting from over-watering. When in doubt “too high, won’t die; too low, won’t grow” is always a good rule to follow.